The Bongongo Angus Stud, established in 1926, is one of the oldest registered studs in this country. Today it is run by Bill and Shauna Graham and their family. 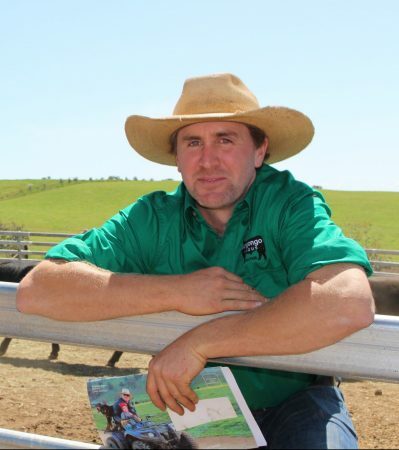 We are very proud to have our son Tom, who is also a veterinarian, working full time in our family farming business and joining his father Bill running our large animal vet practice Coolac Veterinary Services. This is a very exciting move and we look forward to having Tom working with us in both our busy dynamic businesses. Our combined passion for agriculture, cattle, genetics and breeding has seen a big growth in our stud and our bull sales in recent years. Today the stud runs over 700 registered breeders and is backed up by a very large commercial herd. It is now based at “Riverview” on the banks of the Murrumbidgee River at Gobarralong (between Jugiong and Coolac). Another property in the higher, cold country at Adjungbilly adds balance to our country. Recently we have acquired properties at Tumblong, south of Gundagai to expand our beef breeding enterprise. We have excellent feedback regarding the structure, confirmation and temperament of our bulls. Here at Bongongo we are continually using our veterinary skills aiming to improve our herd genetics, through extensive use of AI and ET, so our clients herds do the same. 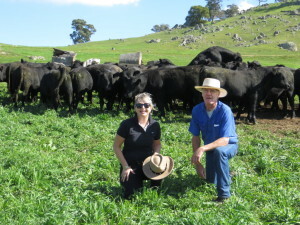 Our many return clients are proof that Bongongo genetics are having a positive impact on their herds. We pride ourselves on our excellent after sales service so please contact us if you have any problems. Thank you for your continued support and interest in Bongongo Angus.